​ I'm here to help. You are a hard-working professional who wants to find ways to have your money work for you! You want to know you’re creating something that will be there tomorrow. Something with an actual strategy and not random luck. Is it possible to go from non-investor to knowledgeable investor in 5 days or less without losing your mind or having a masters in finance? Here’s The Framework that cuts down your investing learning time and efforts by 50%, but triples your actual chance of investing. 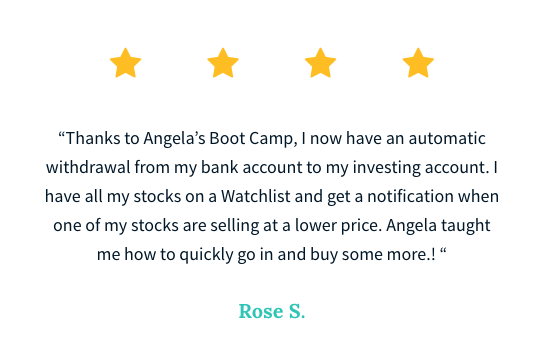 The Happy Investing boot camp is your digital crash course to investing in the stock market! Over 3 days you will receive Easy Online Classes for Investing in the Stock Market. This is an introduction to investing and is a course for Beginners! You can learn at your pace ANYTIME! ANYWHERE! JOIN US FOR LESS THAN DINNER FOR 2! You have been told investing is necessary to grow your wealth, yet led to believe it’s extremely complicated. You don’t have thousands and thousands sitting around to invest. You buy a book to figure out this seemingly complicated world.You consider shifting to a Financial Planner or advisor but you don’t understand the fee structure or half the things he says to you. All of these and you still don’t have much clarity or investing savvy. After all, you just wanted to see opportunities and be able to seize them, to save a little something for the latter days. Have it all with the power of investing! I HAVE DEVELOPED A SYSTEM that takes away.. It literally and truly takes you from non-investor to confident happy investor in 3 days without having to sell your first born. Who am I and Why You Should Listen to Me? Hi! 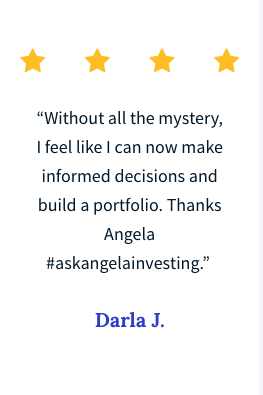 My name is Angela and I am extremely savvy with helping people breaking through the language and knowledge barrier of investing. I used to be clueless about investing in the stock market, how to jump in, where to go. I only heard rumors that this is how extremely wealthy people make and keep their money. Now, not only am I one of those people, but I love to teach others how to simply invest. I have personally invested in over 250 companies, have been featured in The Huffington Post and Sirius XM and have a tribe of thousands that come to me for investing guidance, hope, and not so serious money banter. In less than 3 years I have been responsible for the investing of over $750,000 into the stock market by my students and myself.. I use simple, proven methods and a system to teach others how to get financial freedom. It won’t work for me because if it was this simple, everyone would be doing it. or an in person workshop that promises me I can invest and make thousands? Over the course of 3 days you will learn about the background and movements of the stock market, the best accounts to set up, how to find the best companies, how to build a real strategy and create a budget. We'll also touch on retirement taxes and the best platforms to move forward. All so you're left with a solid foundation and understanding of how to build wealth in the stock market. What will you learn during the Investing Boot Camp? What if I can't make all of the days, do I need to be there in person? The videos are delivered straight to your inbox. Whether you look at everyday or anytime it's up to you. How much experience do you need to have? This program was created for people who have little to ZERO experience with investing in the stock market. How long can I review the information for? You will have access to the information for LIFE. Yes, we have a 30 day satisfaction guarantee! YES, I WANT TO BECOME AN INVESTOR! What is the investment to join? Want the information for life or to join every other boot camp? Get LIFETIME access for only $97! YES, I'M READY TO LEARN!